We indulged ourselves with this quick dish after a long day, just by popping in a Chinese barbeque shop and grabbing away with a half roast duck. All other ingredients are kept in my pantry and fridge. It’s quick to make on the go. 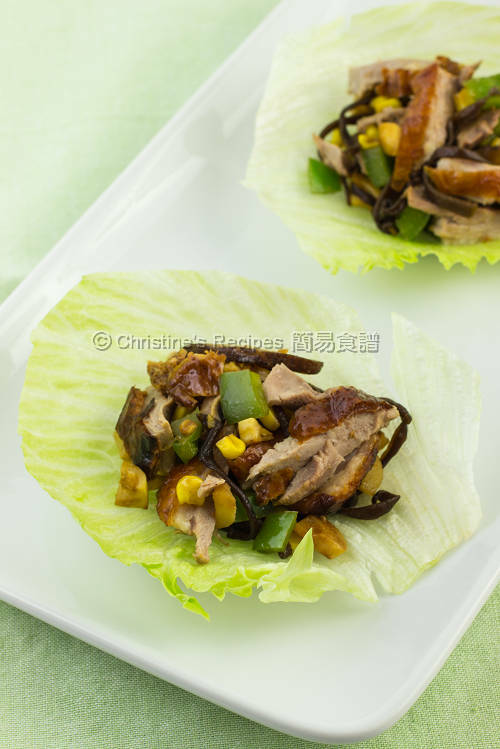 The crispy lettuce and vegies just balance the taste of the roast duck. By using both hoisin sauce and sweet bean sauce, you’ll take the dish up a notch. Trim out and shred the duck meat and shred. Set aside. Blanch the wood ears in boiling water for about 8 minutes. Drain well and then shred finely. Shred the shiitake mushrooms. Set aside. Heat oil in a wok over medium-high heat. Saute the mushroom until fragrant. If the mushroom soaks up the oil, add more. Then saute the garlic and sweet bean sauce. Toss in the capsicum, corn kernels and wood ears. Stir to combine well. Stir in the seasoning and water chestnuts. Finally toss in the shredded duck. Spoon mixture into the lettuce leaves. Serve immediately. 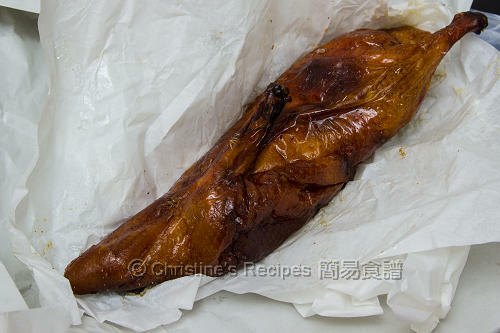 Roast duck can be found at Chinese bbq shops. You can remove the duck skin or keep the skin on when shredding. Either way will do. Save the carcass for making stock or porridge. It’s really delicious. I used this brand of sweet bean sauce. Quick, easy and inexpensive meal! Great idea of adding in mushroom etc. 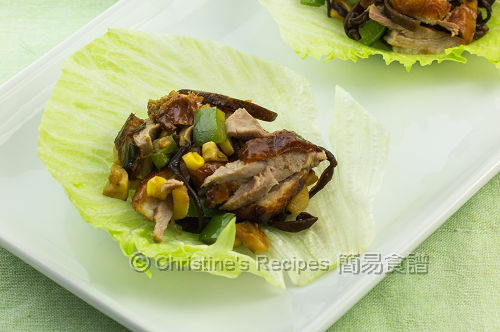 Haven't had bbq duck in a long while...those lettuce wraps look mouthwatering!